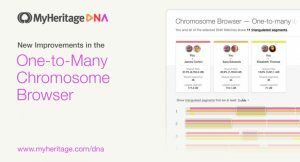 MyHeritage has implemented improvements to their recently released One-to-Many Chromosome Browser. These changes were made because users requested them. Three new additions make it easier to use the Chromosome Browser pages and provide additional information about your DNA Matches. The first improvement allows you to easily reference your comparison set at all times. The DNA Match cards will now remain docked at the top of your screen as you scroll down the page. This works on both desktop and tablet, on the page where you select your comparison set, and on the main page of the Chromosome Browser. You can now remove DNA Matches that you have already selected for comparison using the docked header. Another improvement lets you review and contact DNA Matches right from the Chromosome Browser. Use the Chromosome Browser, and look for three dots that will appear in the upper right-hand corner of the card. Click the three dots, and a dropdown menu will appear that will give you the option to go to the DNA Match Review page for that DNA Match. The dropdown menu also has the option to contact the DNA Match. If the DNA Match is not the manager of his or her own kit, you will have the option to contact the manager of the DNA Match’s kit. Contacting DNA Matches is free for all users. The third improvement is the addition of an indication for triangulated segments from the DNA Match Review page. MyHeritage added an indicator for shared DNA Matches who share triangulated segments with you and the DNA Match you are reviewing. Triangulated segments are shared DNA segments that you and two or more DNA Matches all share with each other, and therefore likely all inherited from a common ancestor. This feature can be used on the desktop. Hover over the indicator, which looks like a triangulated segment icon. A tooltip will show you how many triangulated segments exist. 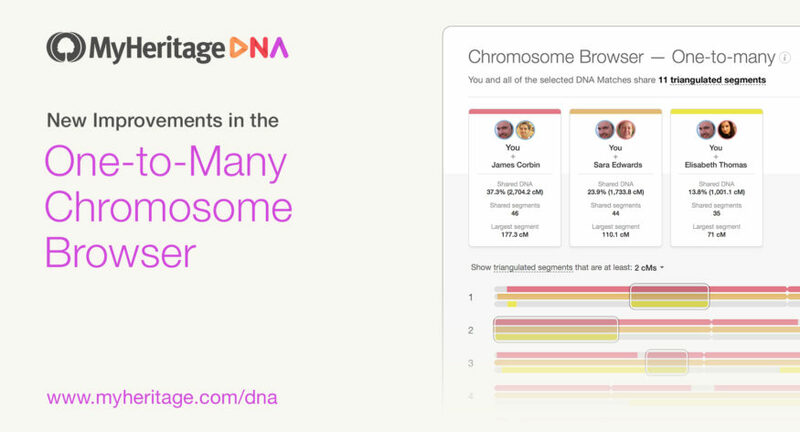 The feature can take you to the One-to-Many Chromosome Browser where you, the DNA Match you were reviewing, and the shared DNA Match that you both have in common, will automatically be loaded as the comparison set.